Tomorrow (Sep. 28, 10.00-12.30h) will take place the first edition of the IQCC Forum, a quarterly meeting-place where high-quality science will be discussed. The IQCC Forum provides the opportunity for young researchers (and more advanced researchers) to present their work to a wide audience. This will lead to better knowledge of the work that is being performed in all the different research groups of the institute, and enables the researchers to communicate their exciting new findings. 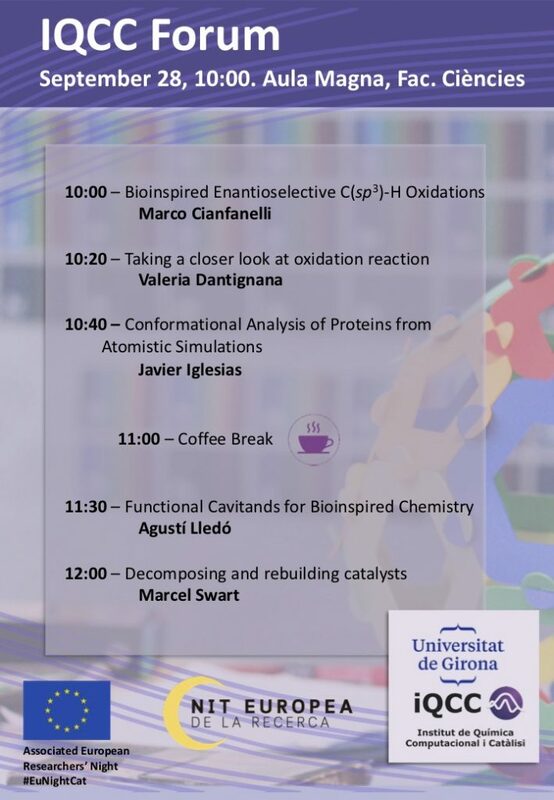 The first edition of the IQCC Forum is part of the European Researchers’ Night program (H2020-MSCA-NIGHT), whose main activities take place in the afternoon (Sep. 28, 17.00-21.00h) for the general public at the Casa de Cultura in Girona. We are looking forward to seeing you at the IQCC Forum!